Enter the Dragon and soak in the vibrant atmosphere of the street markets, where it is said, you can find just about anything! 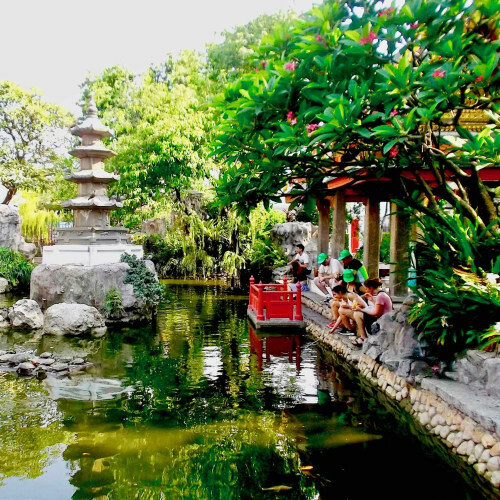 Take some time out in the old Portuguese community, relax in the cool shade of the temple grounds and feed the hungry turtles! We will meet you at our Clubhouse and show you a short safety video before selecting a bike that is suitable for you. 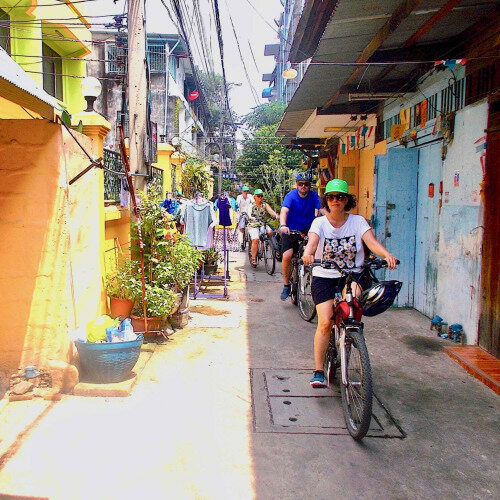 We will then cycle through the maze of colourful back streets and experience a unique insight of local life in Bangkok. 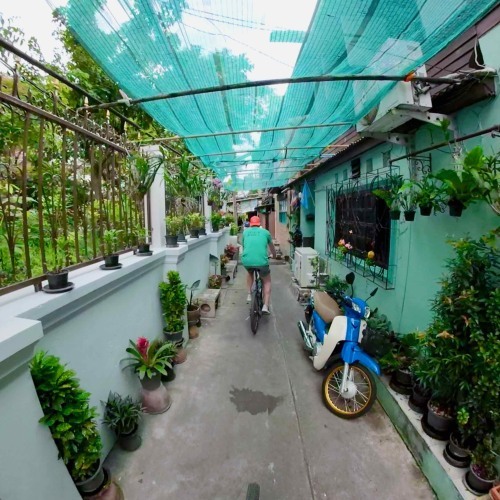 We will discover the charming ‘Old Bangkok’ atmosphere as we explore the delightful old Muslim and Chinese communities and we will taste some delicious street food snacks. 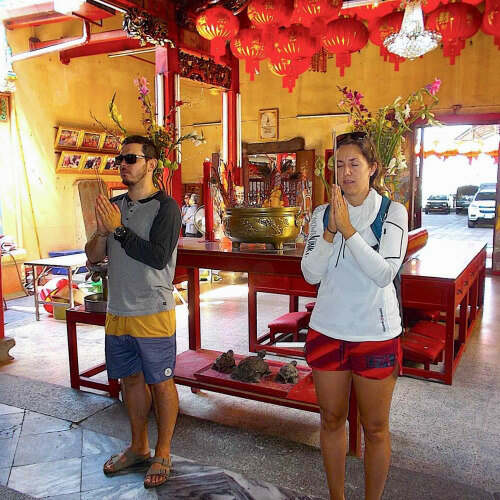 At the local Chinese shrine we will make offerings to the deity and wish for good health and protection. We will continue our journey into the busy streets of Chinatown. 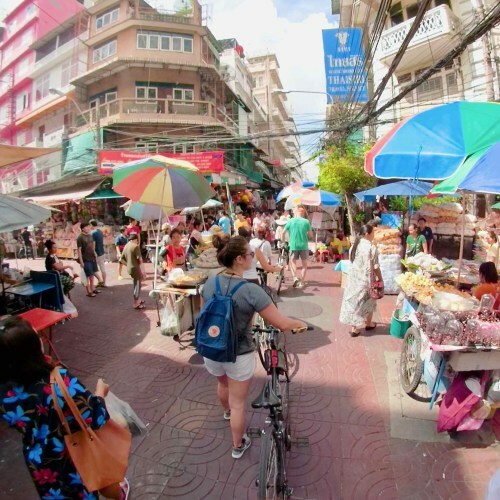 We can absorb the vibrant atmosphere as we explore the bustling market stalls and street food vendors. Down by the river we will walk through the beautiful scent filled flower market. 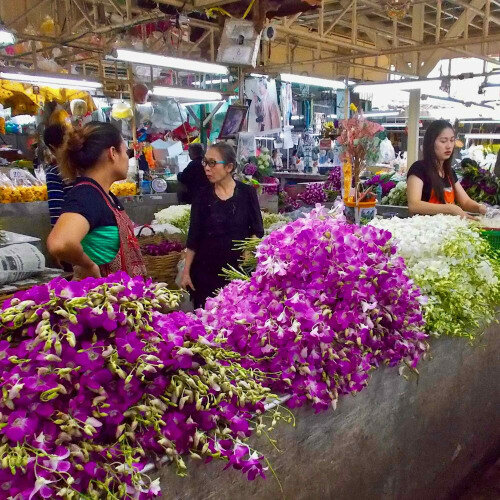 All your senses will be awakened as we explore the colourful market stalls that are filled with dazzling flora from across Thailand. We will cross the River of Kings to the old capital of Thailand and relax in the tranquil temple grounds as we feed the hungry turtles! 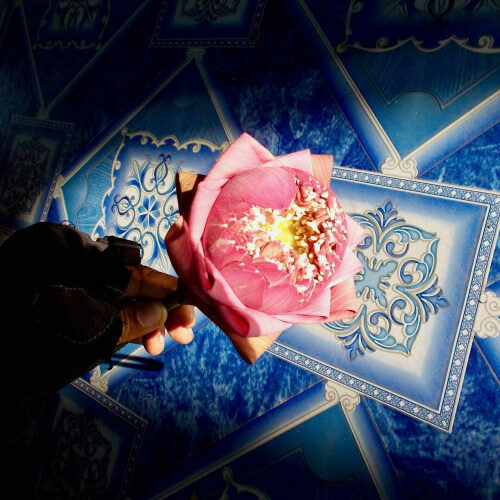 As we explore the peaceful riverside temples we will explain about the beautiful culture of Thailand and make an offering to Buddha. We will return home along the meandering river cycle path. 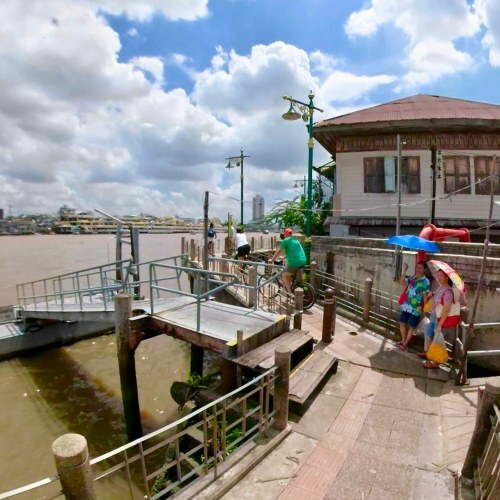 Crossing the river by ferry we will enjoy the unfolding city views and the relaxing cool breeze. Back at our Clubhouse you can relax in our peaceful garden. 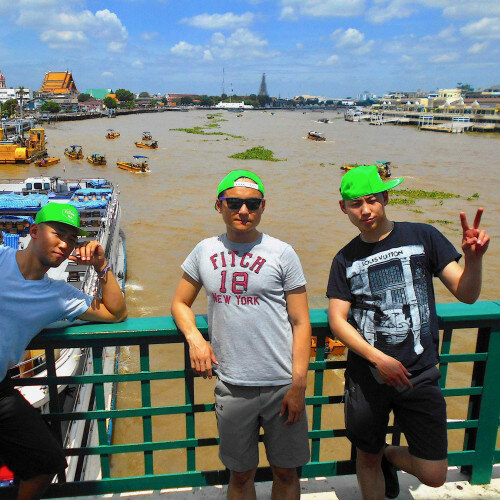 Don’t forget, the following day we will send you a link to download the memories of your Bangkok experience. Your safety and enjoyment are our main priority so we limit the group size to a maximum of 8 guests. For larger groups we have additional guides and the group may also be split. To join this tour, you must be able to ride a bicycle. Children are welcome but as parents you must decide whether this tour is suitable. If you have children in Your Booking we recommend a Private Tour that can be tailored to suit your kids. This tour will not be cancelled if it rains. In Bangkok the rain tends to be very localised and rarely lasts more than 30 minutes, either way don’t worry as we provide free rain ponchos. This tour starts and finishes at our Clubhouse , we will send you a detailed map on how to find us with your Booking Confirmation. You can pay by cash (Thai Baht only) when we meet on the day of your tour. You can also pay online by Credit Card or PayPal; details will be in your Booking Confirmation. 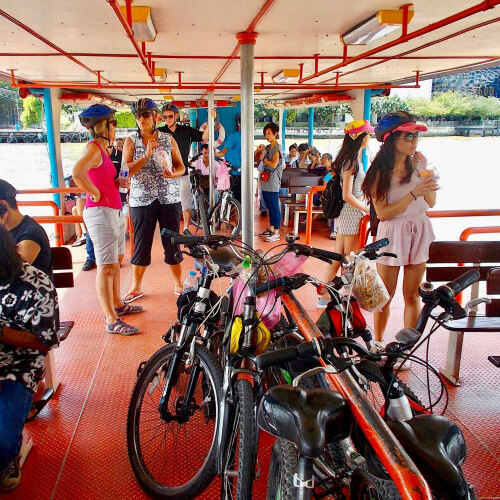 The tour duration may be affected by the groups cycling abilities, or other unforeseen factors, and your guide may have to make impromptu changes during the tour. If you prefer you can book a Private Tour, please select the option on the booking form. You may find our FAQ’s useful; if you have any other questions please Contact us.